This Is Why. Day #2. When I Get Bored Running. During my run I was feeling pretty bored. 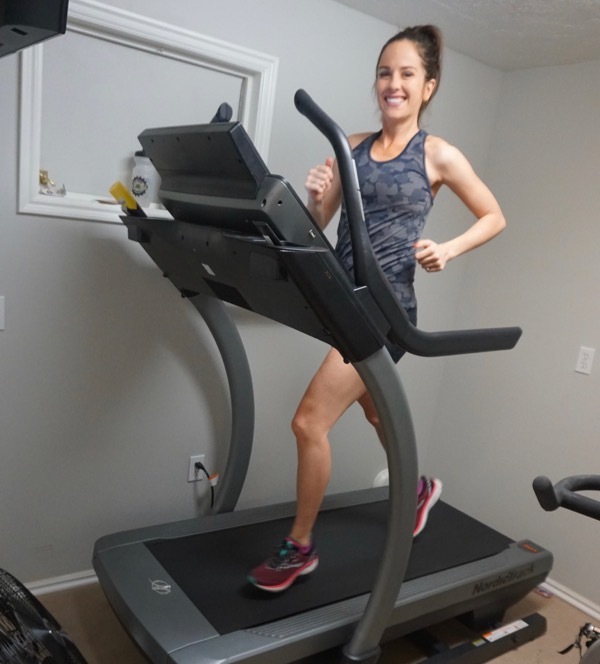 I don’t get very bored when I am running outside (although I had a 12 miler a few weeks ago in the dark where I felt pretty bored at the end) but it definitely does happen on the treadmill. 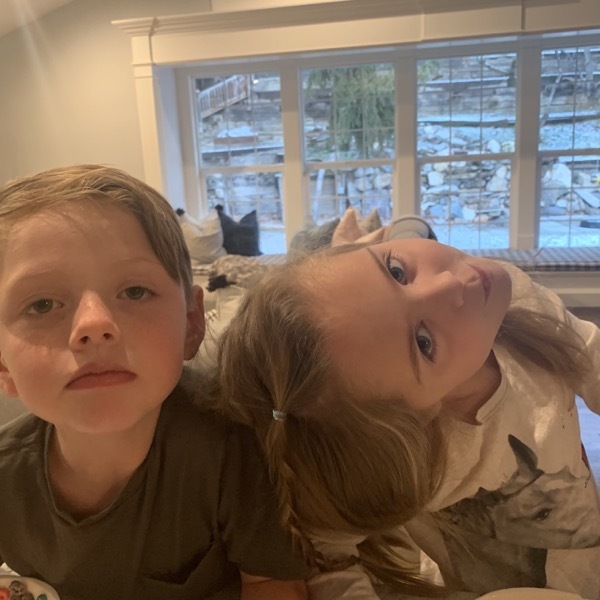 And the thing that popped into my head when I was feeling bored was what I tell my kids whenever they come to me and say they are bored—> I tell them that being bored is good for their brain. Too often through their day they are being told what to think and fed information so being bored gives their brain a chance to come up with things to think about. So now what I say to the kids comes back to bite me and when I’m feeling bored on the treadmill I have to take my own advice;). So my treadmill run was good for my brain too. And then the big kids were off to school. The day was a blur but I do remember we were ready for a bath and pjs at 4 pm. So instead of a chore for the day I put Brooke and Knox in charge of keeping her entertained. 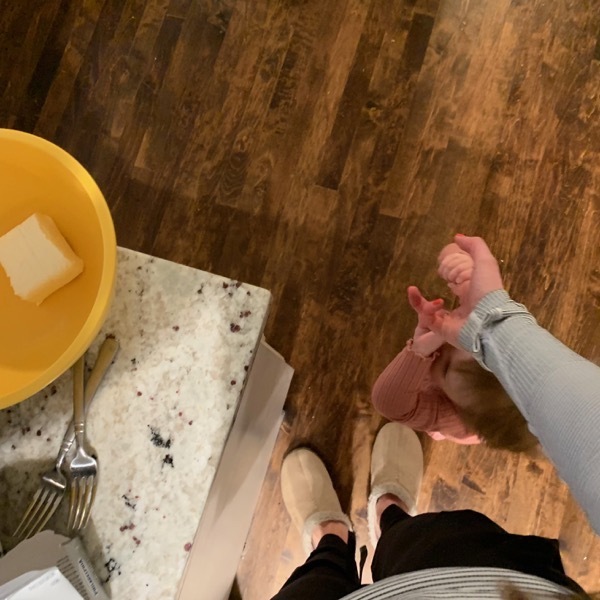 This might be how dinner happens from here on out. 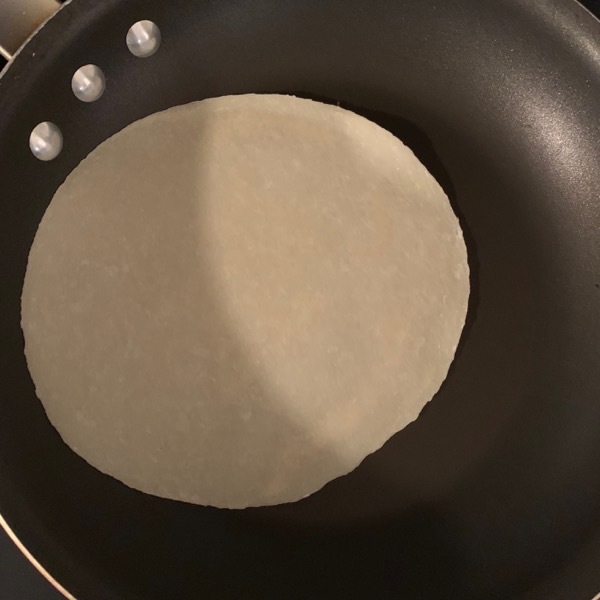 The tortillas that you have to cook yourself are my favorite kind of tortillas. Day 2 of a meal that everyone in the family will eat without complaining;). I really loved them too. And for dessert followed by a bowl of cereal. Andrew had his 2nd shift (of 15 before he graduates!!) and it went really well. I bet he wishes he could tell me about some of the crazy stuff he learns or experiences but the mention of blood makes me want to pass out. Looks like I might have another snow run with my friends. They are joining me for the 1st 15 and then I’ll do the last 10 on my own. And this is why I haven’t been on the trails much anymore… I’m freaked out now to go unless I’m with Andrew. Hopefully the hills I’m climbing on the streets are going to prepare me. Also, yesterday Elizabeth told me that some parts of North Texas are having problems with aggressive coyotes attacking runners—> STAY SAFE OUT THERE. I definitely would not win in a fight against a mountain lion. 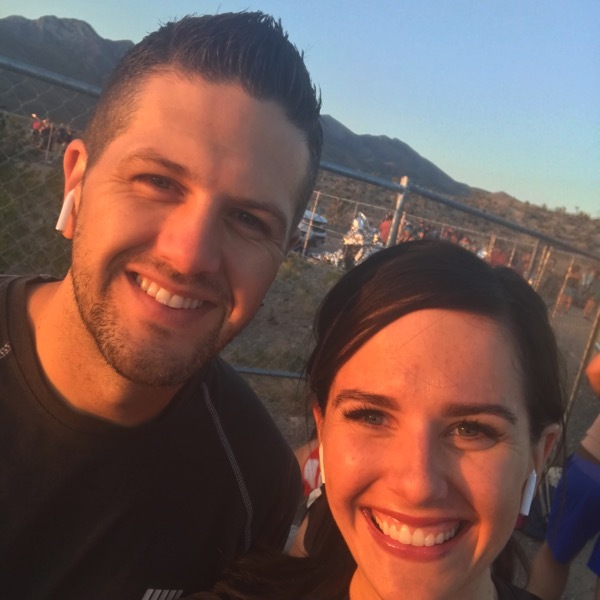 My brother (above picture from his first 1/2 where he said he would never do a full… PS we are big fans of AirPods obviously) is running the Phoenix Marathon on Saturday and it is his first marathon! I gave him a pep talk yesterday but I was hoping that you could give him some encouraging words for his FIRST marathon too. Any tips or things that help you when you feel nervous for a big race? Does blood/medical stuff make you feel woozy or not at all? What did you use for fuel during your last long run? If you could only choose one for the rest of your life… Guacamole or Salsa? How Not to Run 25 Miles, Our New Business Model & Health > Running. Stamp on my face, try this homemade pizza and 30.75 miles! 11 things from our day! 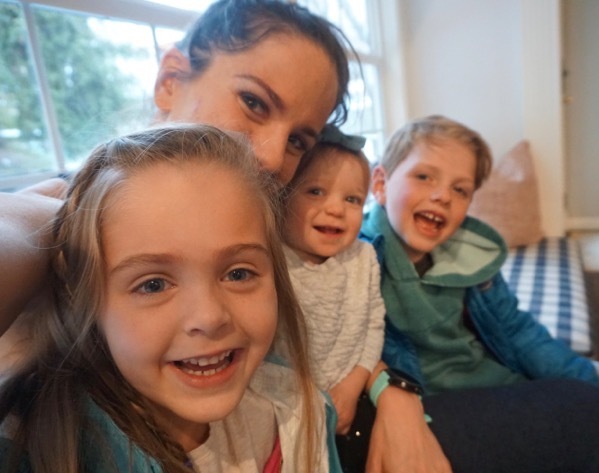 My first post-baby TEMPO + how we got Skye to sleep through the night! To your bro: YOU GOT THIS, BUDDY!!!! Take Janae’s advice, and remind yourself that YOU CAN DO HARD THINGS! Guacamole. No question. Also, HAPPY NATIONAL FROYO DAY!!!!! Hope that you get to enjoy some today! Blood makes me a bit woozy. Good luck to your brother. I always tell myself to trust my training and that I can do hard things. The body can do more than your mind thinks. Gummy bears at my last long run. It was only a10 km loop but I procrastinated so I was a bit hungry when I left. I had them in my running belt for emergencies. I must replace them. Guacamole! We had tacos yesterday. I’m now making your Italian chicken soup for the second time. Replace those asap and that is such a great idea to have some in your running belt for emergencies. YAY ENJOY!! Thanks Eva and you are so right about our body being able to do more than our mind thinks. Good luck, brother! The first tool I’ve used in the past is not a very “Oprah stay in the moment” tip BUT… :) what helps me right before and during the race (in the hard parts) is to think about a wonderful trip and where I want to go. I make my mind go to a comforting place. For me it is lying face down on a towel on the sand on a perfect 85 degree day somewhere in the Caribbean. So imagine when you are most happy and where you are and picture that place when you are not feeling the best. And then plan the trip and what time of year you will be going there :) Another one that is more a “stay in the moment and enjoy the moment” – at each checkpoint, imagine that you are saying “hi” to your friends who are tracking you. Like each time I would pass a 5K checkpoint at Boston , I knew my friends would get an alert of my update and I felt like I was waving hello and smiling. Enjoy! And I can’t wait to read all about it :) Hope you’ll do a guest post of your experience. oh – and sorry, I was so focused on the excitement of your brother’s marathon. GOOD LUCK on 25 miles (you might be out there now or done by now…) 25 miles is no joke! Is that the longest you’ve done in training besides your marathon-on-the-treadmill? Not a big fan of medical stuff either. On my last long run I used SIS gels. I like that they are more like liquid and less like gel so they don’t leave a film in my mouth. PS – yesterday I told you about the documentary “Where Dreams Go to Die” but forgot to tell you it’s on YouTube. If you figured that out I’m curious to know what you thought. 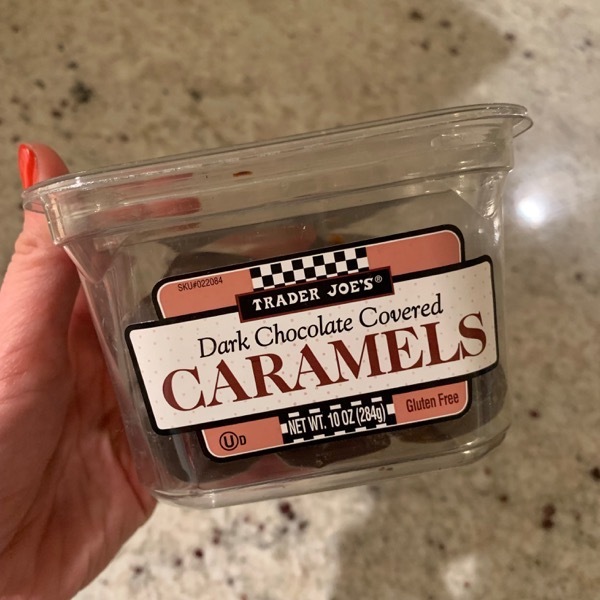 YES… I found it and I’m saving it for my treadmill run tomorrow. Thank you Angie! I need to try out SIS gels, that sounds perfect. I hope you are having a wonderful day! Have a great 25 miler! Your snack selection is on point. Bahaha I have never seen that before… it’s perfect. Thanks Victoria and i hope you are having a great day! Bring your AirPod charging case. When you hear the first sound they batterybis getting low, put that AirPod in the case. It will fully charge in just 15 minutes then you can charge your other one, then use two again!!! Blood/medical stuff does not make me feel woozy at all. But seeing someone’s throw up however (whether or not I saw it happen) totally makes me puke. On my last long run I used Gu Chomps. If I could only choose one I would pick queso. But since you did not give that option then salsa. But I love Guacamole too so I would rather have one of those cute little trio platters with all three!!! I didn’t know that about the AirPods… AWESOME. I will let you pick queso and now you have me craving that and a trio platter. Have a beautiful rest of your day Tonya. To your brother-This weekend is an automatic PR! You’re ready to get this DONE. Whenever you’re feeling like it hurts too much just remember how lucky you are to be there. Look around at the people, the scenery, give a high five. It will go by faster than you think and then you’ll be a marathoner! That mountain lion story freaked me out! There were a bunch of attacks in San Diego when I was younger and I always felt on edge running the mountains around there (although I did it anyway, because it’s so beautiful). I don’t think I’d win against a mountain lion either. I’m kind of weird about medical stuff. If someone just talks about oh I saw some blood or here’s a picture of a *whatever* then I’m fine. But if I start thinking about the pain the person is in or I’m with the person and can obviously see its causing them pain->that is when it makes me nauseated. Very strange, I know lol. Fuel for my last long run was SIS gels (science in sport). They are my FAVE bc they are isotonic so you don’t have to drink water with them and they go down super easy. Those tacquitos make me want some Mexicano food now! 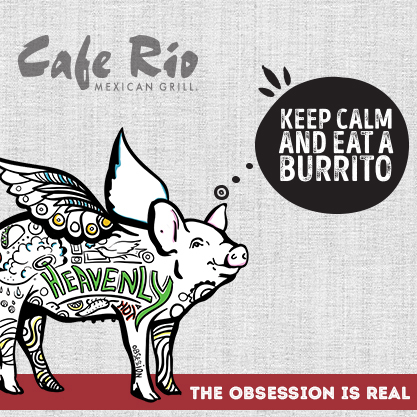 But I refuse to choose between guac and Salsa…thats just scary. Yesterday my co-worker leaned over and said, “My friend just sent me this article. It’s her brother in law.” She showed me the mountain lion article!! And guac all the way. No way! The whole trail running community here has been wondering who it was. Glad he is going to be ok! AHHH really?! Keep us updated with how he is doing! Hungry Runner Brother: Remind yourself with all the feels, anticipation, excitement, pain, wanting to quit, exhilaration: This is what feeling alive feels like! Blood, needles, any of that: fine……..vomit gets me every.time. Fruit snacks were my last long run fuel. Those tacos look good! My kids wouldn’t be fans but they are super picky so hard to find something we all eat. And that camo tank you are wearing on the treadmill – where is that from? I love it! Also, love the answer to your kids about being bored. I’m going to remember that and use it too! I hope you are having a wonderful day Mary! Ahh, best of luck to your brother – first time marathon is special! 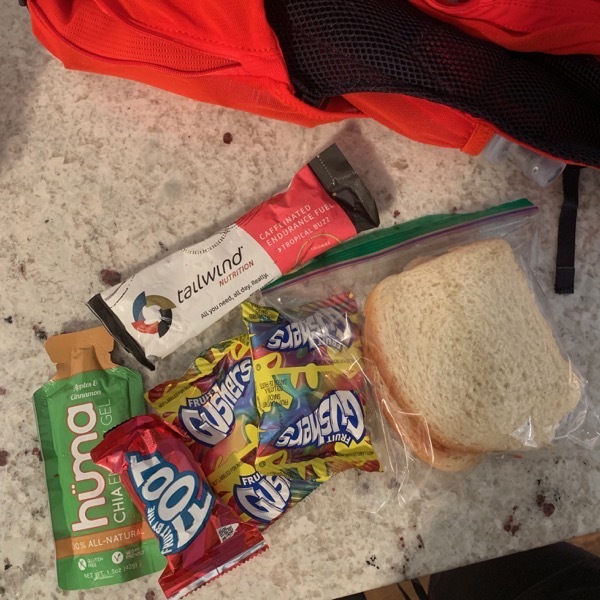 My best advice – do not wear, eat, etc anything new on race day. Try it out first or save it for another race. Enjoy one mile at a time, don’t worry about anyone else, just do you. It helped me to dedicate each mile (i did last 5 miles) to someone special in my life. Some people did all 26 that way, but I couldn’t keep that much straight in my head on race day! I love that you dedicated miles to important people in your life. Such a good idea and awesome advice, thanks Cathy and I hope your Wednesday is going great! Can I get the recipe for those homemade tortillas you show in your skillet? Thanks! HEY!! I just buy these at the store. Costco has them and our grocery stores do too. They are in the refrigerated area. SO GOOD! First marathons are very special!! I can only say to save some for the last few miles–pretty much guaranteed they’ll feel tough, but your training and toughness will carry you through. Have a great run!! I’m fine with blood & medical stuff, but being near people actually getting sick is awful. TMI? I also hate it when I see people barf on TV, LOL. Guacamole for life! I’m not a big salsa fan, except mixed into dishes like the bowl meals I made for dinner last night. But guac is good for everything, anytime. Hoping you have a gentle run in the snow and lots of warming back up after! I always say you know what I would do to be bored?? Lol I’m sure I’ll have to eat my words too once I get my treadmill fixed. Congrats to your brother we want to hear all about it!! BAHAHAHA I agree… outside of running there isn’t really time to be bored;) . We are going to have animal control set one up and release it somewhere better for it. Thanks Christina, I hope you are having a great day! Guac – every single time. Being a nurse I deal with blood, poop, urine, vomit and amniotic fluid on a regular basis and never flinch. Get me near mucous and I lose my mind. Seriously, I gag every time. Also, broken bones before they are fixed. I would be a terrible trauma nurse. That is SO interesting about mucous driving you nuts but all of the other things not even phasing you! BE CAREFUL RENÉ! That is so scary! Yeah, that trail with the mountain lion attack – I run it ALL THE TIME. I was just on it last Saturday. Probably will steer clear for a while. They closed that park and the state park that is adjacent to it as there were two more mountain lions spotted that showed no fear of humans. Good luck to your brother. I remember when I said I would never run a marathon – I ate those words. 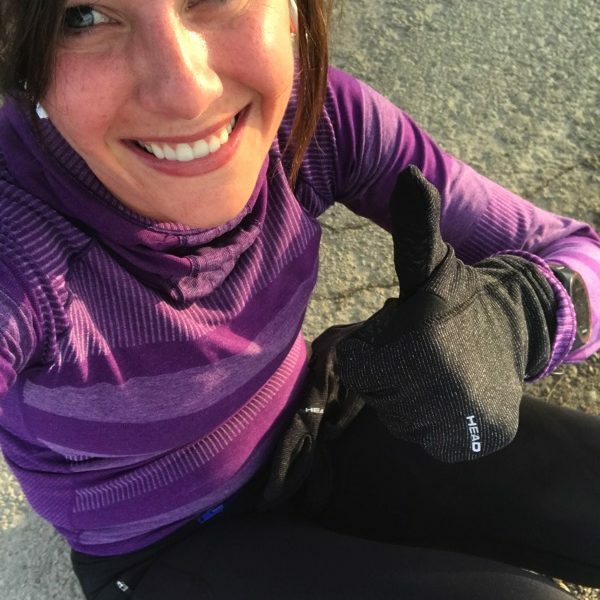 We are expecting COLD and snow for the next few days so although I love running in warmer weather, the snow changes things up and I never get bored running in it! I don’t like guacamole but I do like sliced avocado. Weird, I know. I’m all about the salsa. I am so so so glad you are okay and please don’t go back to that trail… that is so scary! I agree, the snow keeps things very interesting! Hahaha I wonder what the difference is between the two. I hope you are having a beautiful day Jen! Good Luck Hungry Runner Brother!! I hope that you are excited and a little bit nervous…that’s a good sign before a race. Just have fun and enjoy the experience. Sending you all the good race vibes from Texas! I can’t wait to hear about your experience! I’m usually okay with medical/blood related stuff. The only thing that really gets to me is when something smells awful. That’s what makes me gag. My long runs are 14 miles right now, so I don’t really need to fuel if I’ve eaten well the previous day. I eat my normal pre-run breakfast (carb+protien & choc milk) and I’m good to go with water and a little sports drink every few miles. There is NO WAY I could choose between guacamole or salsa. They are like my two main food groups! Also, when I make guac at home I put salsa in it to make it even better. Have a great 25 miles Janae! I’m so excited for you and Andrew to run your Ultra! You got this HRG’s brother! Believe in your training and enjoy the scenery! I also like to picture the giant cheeseburger and plate of french fries I will consume shortly after crossing the finish line. Guacamole 100% if I had to choose. I did back to back longish runs over the weekend (7 on Sat. and 8 on Sun.) We were out of Gu’s. I should have grabbed some candy or something but I didn’t. Totally regretted it. When I finished my 8 miles I was so hungry and lightheaded and then I realized I totally missed lunch because I was running. I drove straight to get a bagel breakfast sandwich. And I can do blood but I have an issue with needles and super gruesome injuries. I saw the bone in my knee after a bike accident and fainted immediately. Being a nurse or doctor was never for me. Kudos to Andrew! I’m totally fine with blood in the context of work (though I don’t see much anymore). I have an issue with skin stuff –rashes, etc. Yipes. The Chicken taquitos look delicious! I’m totally okay with medical stuff. Ever since I took biology in high school I thought the human body was so interesting. It probably makes sense that I eventually got a diploma in personal training. It’s SO COOL how the body works. Good luck to your brother! He’ll do great! It’s so funny that you shared that mountain lion article – I shared it on my blog this morning, too! HA! I cannot imagine what I would do in that situation – here’s to hoping I never encounter that! Same to you! Question for Janae (and anyone!) I’ve been having some wicked knee pain (IT band issue) and I’m wondering your thoughts…to run or not to run on it? I’ve been rolling and stretching and been to the chiropractor, but I’m training for a 1/2 right now and don’t want to get too off of the training plan. Any tips/advice? Thanks! My rule of thumb is if the pain goes away after you warm up and start running, then it’s probably ok to run on it. If the pain gets worse or it “hurts” to run on at all then I don’t run on it. I will use the elliptical or recumbent bike instead (assuming that causes no pain). I will also usually “google self diagnose” myself first. Then, I will double check with a PT (we have them here at work for free) to make sure it is not something more serious and I don’t need to see an actual doc. Thank you so much, John! I so appreciate this tips! GOOD LUCK and I hope you get to your half! Keep me updated. -First marathon tip – just do it for fun. Don’t stress about pace or time…just get it done and use the experience to plan and evaluate for the future. -Medical stuff is fascinating, not woozy. Hello Janae:) I have an AIRPODS question for you. I have airpods but have only used them at home, my gym headphones are breaking (they are bluetooth also). But I wanted to try out my airpods for the gym too. My question I like to adjust my sound easily while running, doing machines….sometimes I want a song up or down in the middle of a run. But with my airpods I haven’t figured out how to adjust the sound easily. I know you can double tap and say ” volume up” but that never works for me in the gym. Do you know of an easier way to change the sound up and down on the airpods? This is the only thing holding me back from using the airpods for my workouts! Thank you! And I hope you didn’t freeze to death today doing that long run today! I am thinking of you! My sister just moved to Utah, and sent pics of the snow and wind today…it looks brutal to this Texan! Hey Amanda! That is a fabulous question. So I actually just turn the volume up on my phone when I need to… I didn’t even know that you could do the double tap volume up thing. If you find a solution let me know and I’m sorry I’m not any help. Oh I hope your sis stays warm and THANK YOU! I think the double tap only works because you are activating Alexa for the volume control from your Iphone. So, no good for us Android users. When I double tap mine it just pauses the current track I think. I believe you can assign the action via the phone app. If Airpods 2 came out today with adjustable volume control via swiping the actual Airpod I would buy them immediately. I meant Siri, not Alexa. Unless you are strapping an Echo Dot to each ear. Medical stuff—I was never super squeamish but it wasn’t my favorite. But then I had kids and kind of had to get over any kind of gag reflex or hesitation. Then with my last one and all of his stuff…oh my goodness…I’m probably one of those moms that might drive Andrew crazy, haha! I can almost tell immediately if a phlebotomist or nurse is going to get a vein for a blood draw or IV, just by watching how they approach my son. In fact, once or twice, with some really not competent folks, I’ve even said, “You know, at this point, I bet I could get the draw if you just gave me the needle.” Please tell Andrew “I know and I’m SORRY! 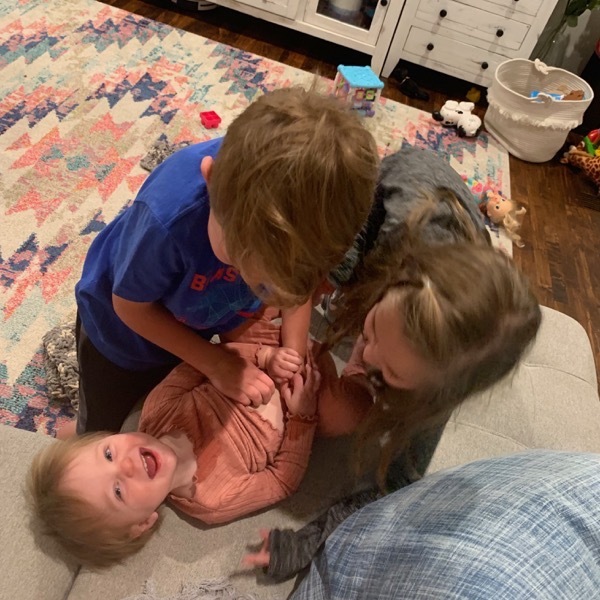 But it was the FIFTH time she’d stuck my kid!” 😡 So, long answer to say, I watch medical stuff (on myself and my kids at least) like a hawk now! Guac ALL the way, baby! I AM SO EXCITED!! This really is so kind of you to do this! Yes, that blizzard was rough haha. I would too if I was you… that is nuts! I asked Andrew and he said he knows I would do the same thing haha (and then pass out after;). I hope you are having a beautiful day and thanks for the help for my brother! I am probably the least squeamish person out there; nothing bothers me like that! People are always surprised by what I can handle, but it comes in handy when dealing with sick kids! I’ve never needed to fuel during a run before, but my favorite thing after long run when I trained for my last half was a big bowl of oatmeal with banana, peanut butter, and cacao if I was feeling fancy. So. Good. GUACAMOLE!!!! Love me some avocados! For that long race: When you are feeling your worst, asking yourself why you thought this was a good idea and wondering if you should call Lyft, SMILE. Smile at the next volunteer you see. Thank them for being there. 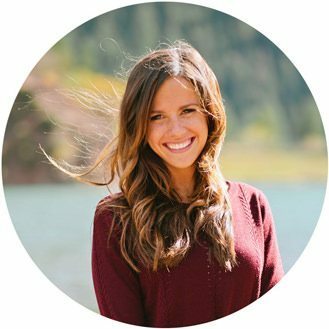 Chat with someone who seems to be struggling. Keep smiling and trust your training! I grew up with a hemophiliac, blood and needles were part of our daily lives. Although I can’t stand to watch videos of cycling crashes because that feels too close to home! Hammer Nutrition’s Perpetuem solids and Hammer gel with water give me zero stomach issues and consistent energy for long runs. I’ve tried other stuff, but this works for me. 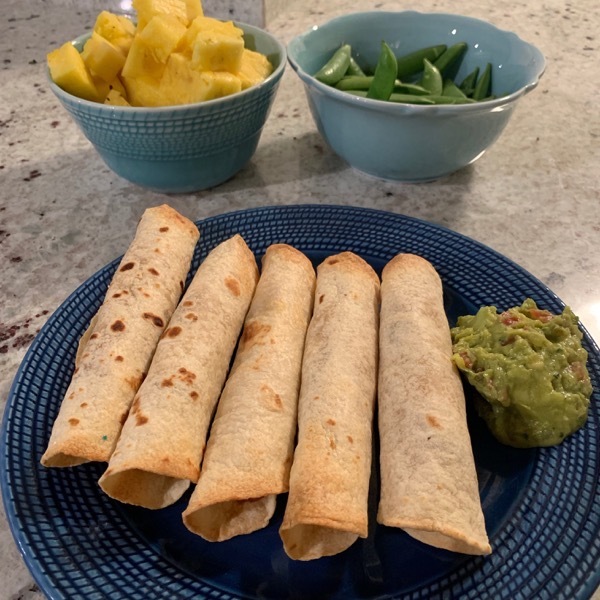 OK I am making those taquitos for Sunday night dinner with Tom. That looks too dang good. You asked about guac vs salsa. My instincts say guac (I love avo way too much) but since this would mean having guac everywhere I go–and some places have ABSOLUTELY HORRIBLE, SLIMY GUAC–I might have to hold off on my instincts and say that salsa winds. Life is WAY TOO SHORT and too precious to possibly have bad guac. I love Knox’s bored face!! And my pep talk for your brother: you trained your booty off now just run because it’s fun and because you can. When it gets hard–as in “I have hit the wall”–don’t think about the whole distance you have left. 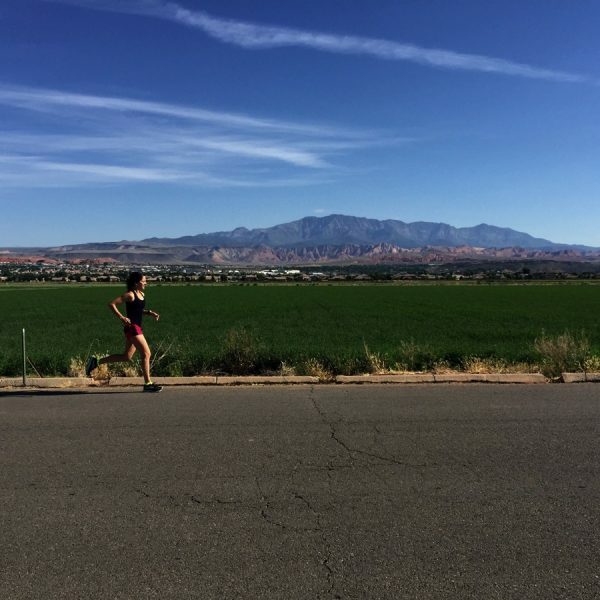 Think instead about running to the end of the next mile marker and seeing how you feel, or running to the next water station, or even the next street lamp of that helps. WHen you break it down to SMALLER goals instead of focusing on all that’s left, you just have small goals to make, small challenges to squash. And you can do that! ALSO–give yourself a playlist of “I feel powerful” songs to listen to in the couple of days before your marathon whenever you feel nervous, and make sure that you place that playlist right around the time you anticipate hitting those last 6 or so miles…then you might remember all the good, strong, powerful ways you feel and you’ll push through any “this is hard” moments. And when all else fails: YOU CAN DO HARD THINGS!!! And it’s only one marathon. How many gazillion are scheduled all over the world? If something happens, then it’s really not the end of the world–it’s just one run that is a culmination of MONTHS of training, which add up to far more miles than this one stretch of 26.2. Salsa all day every day! I don’t like Guac, but LOVE salsa and I always put a ton of salsa on one chip! I had briefly heard some coworkers talk about a mountain lion attack, but didn’t pay too much attention! I definitely would not be strong enough to fight off a mountain lion! I usually run with my dog, so I feel a bit safer… she’s 100 lb tall lab/greyhound mix… but hopefully we never come across a path with any large animals! To your brother: Good luck and be sure to take in everything! When I ran my first (& only) marathon, marine corp in DC, I got emotional sometimes when I saw how many people came out to cheer on us runners. It was amazing and helped to keep me going! I can handle a lot of medical stuff… but the things that gross me out are more surgical related stuff… like cutting into people… can’t watch those scenes in shows. I didn’t fuel too much during my long runs, but I would sometimes take shot blocks or gu. I’m also super slow eating gu and only take a few sips and can basically make it last the whole run. HRG Brother – YOU’VE GOT THIS!! You put in all the training and now just get to let your body fly. And some advice I learned from your little sis, when things start to feel tough, concentrate on the parts of your body that feel good (earlobes and eyebrows can be powerful). Good job Janae on your dinner, that looks delish!! And your Cooney story cracks me up. We get raccoons in our yard from time to time and they can be nasty (dog vs. raccoon the raccoon always seems to win), but once I woke up to one playing on our slack line and it was adorable, so I try to think of them that way now. Thanks for helping my brother! And now I’m going to try to think of the raccoon on your slack line playing when I’m afraid of Cooney haha. Have a wonderful day Michelle! Fuel- Honey Stinger Vanilla Gel. Guac. More reliable than salsa. BEST OF LUCK to your brother!!!! I feel like I’d give the standard advice, but start nice and slow so you have plenty left in the tank, for the first marathon it’s all about enjoying the ride :) Soak it all in! 25 miles!!! YOU’RE basically running a marathon, too!! I hope it was amazing and not boring at all and that you recover very quickly. I hope your brother has a great time! I’m sure you’ve told him already but my first marathon tip is to do the first half slower than you think you can go, save the faster paces for the second half. Also, hydrate the day before; don’t chug a lot of water the morning of or you’ll have to pee too often. love reading your blog…. have read for years! I know you’re training hard but just need to finally share a thought I’ve had and really noticed it today..you’re looking really thin again… I know you’re logging big miles and I know you say “I don’t post everything I eat” but I think maybe swapping a few salads for more calorienheavy meals would help. I run but not a fraction of what you do and if I ate salads (I know you add protein and avocado etc etc but STILL) I’d drop weight too..l just be careful because I know you wanna Have more babies etc and I know it can be hard with all the working out you do etc etc). sorry if I’m offendeing you I’m not trying…I just often see your mileage of a 7,8,10 mile run…day in and out… or even your 20 mile plus recent runs and see you lunch and while it looks delicious I can’t help but think how underfueled you must be…. just a friendly reader comment. 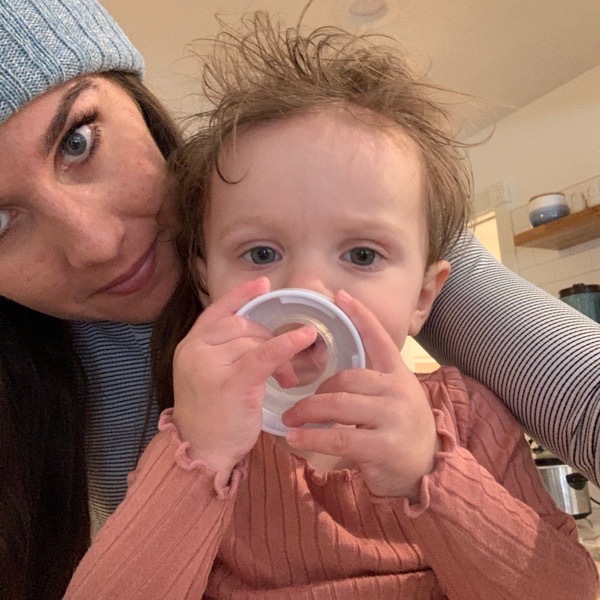 I love your blog… following your fun family, love your meals and all… just remember you are burning like crazy calories. since my marathon in October! I started weighing myself weekly to make sure that I’m eating enough for my training! I pretty much eat all day long to support all of the calories burned but I also want to make sure I am including plenty of nutrients to help my body to recover with things like salads too. My cycle is still exactly 28 days regular and if that wasn’t the case, the running would stop because I have found how important my period is for my health and desire for more babies. I hope you have a beautiful day! ok well that is awesome! I gain weight also when I amp up my miles (but for me that’s going from running 2-3x a week for 1-4miles)… so that makes sense to me. I bet you gained muscle and it just looked like you had lost to me! keep blogging – yours is my fave read by far! Here in Michigan, the coyotes are taking off with residential pet cats that are outside! It’s horrible! I cannot imagine fighting a mountain lion! Our instinct is to fight or flight and this man was so brave to stay and fight! Sad for everyone but I’m so glad he is ok! Janae! This is a day late….but I have a raccoon story for you! They are abundant by us….but not quite as large as bears! When I was younger, I had one of those kiddie pools in my parents backyard. So, one summer night, I hear splashing in the pool and I’m thinking…it’s the middle of the night!?!? What in the heck I’d going on? I put on the lights and a family of raccoons were playing in the pool! They love water! They even dip their food in it before they eat it. It was kinda cute tho…from the confines of my upstairs bedroom! And needless to say, but from that moment forward it was deemed theirs to enjoy for the rest of the summer. Caroline… oh my goodness!?! That is too funny… they were just having a party out there. I love it and I would have done the same thing haha. Have a beautiful rest of your day! Go Hungry Runner Brother!! You got this! 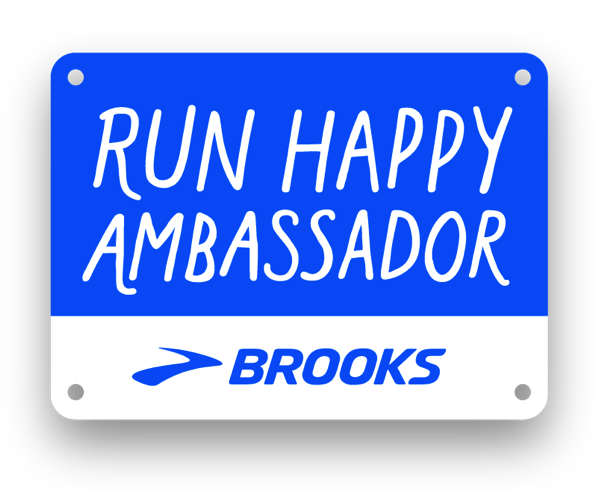 And don’t forget to smile and enjoy where you’re running. Take it all in! The sights, the people, everything!! I can’t wait to hear all about it!! Go HRG Bro! You are going to rock your race. Just take it one step at a time. My last long run I used a combination of sour life saver gummies and trail mix. So yummy and quick. For your brother: remind yourself of the hard work you’ve put in. Look back over your training log. Your body is strong and your mind is stronger. Picture the finish line and how strong and proud you will feel at the end during the hard times. Now will you give me your brothers pep talk? Lol also running Phoenix as my goal race! To HRG’s brother! You’ve got this. 100%. You’ve done the work. Run the mile you’re in and just enjoy. I still look back at my first marathon with such fond memories. Try to take it all in. If you get emotional around mile 25 cause you know you’re gonna finish, that’s okay! You’re gonna be so proud of yourself and your hard work. Can’t wait to hear the follow up. Good luck!! You got this HRG’s brother!!! And good luck to your brother! Tell your brother to have fun! And start SLOW or you will pay haha. And don’t forget to drink and eat. Hope you had a great day Janae! Good luck Brother!!! And yay for an automatic PR! Haha, yup! While I was holding my 2 year old while they took blood, I passed out. I blame it on low blood pressure. My last long run was 1 jelly bean. It did not go over well. I have such a difficult time chewing during a run but Gu kills my stomach. I’m thinking about trying Gushers since they have liquid in them too..?